How to model beams in STAAD.Pro? Previous Topic: How to create nodes in STAAD Pro? You can create a structural model by creating nodes, followed by joining them or by directly creating nodes from Snap node/beam. Let us see each one. Create beams by snap node grids. Once you start a model with add beam option, you get grid and a snap node/beam window. how to set up the grid is shown in Create nodes. Once you have set the grid, just start creating beams at the intersection of grids. Make sure Snap node/beam is on. You don't need to press CTRL when creating beams. If you want to end the beam creation, press ESC. To start creating beams again, click snap node/beam at the bottom of snap node/beam window. 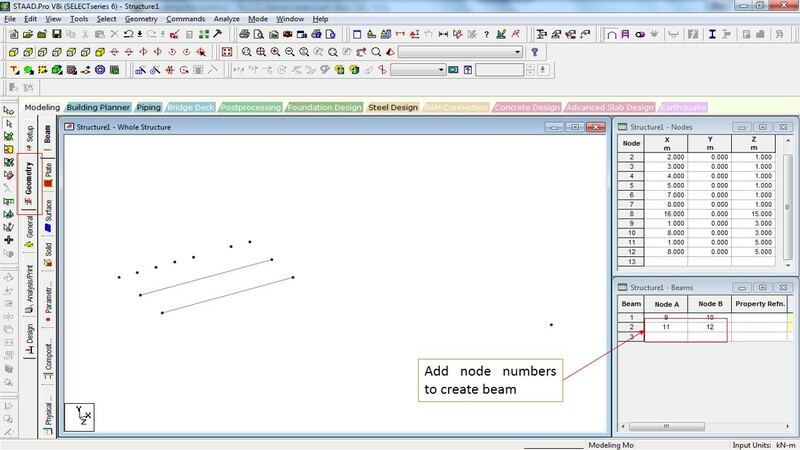 Join nodes by entering node numbers in beams table. 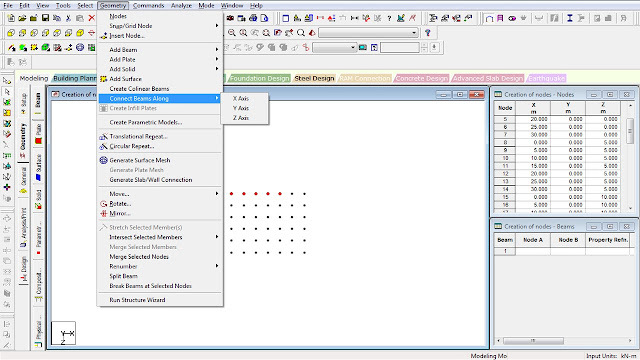 Enter node numbers the beams window in geometry panel. If you can't see the beams table, just right click on any table and select beams. Make sure you are in geometry panel. Enter beam detail in input file. You can go to input file from the symbol shown below. or go to Edit --> edit input command file. Add the beam detail under member incidences section. 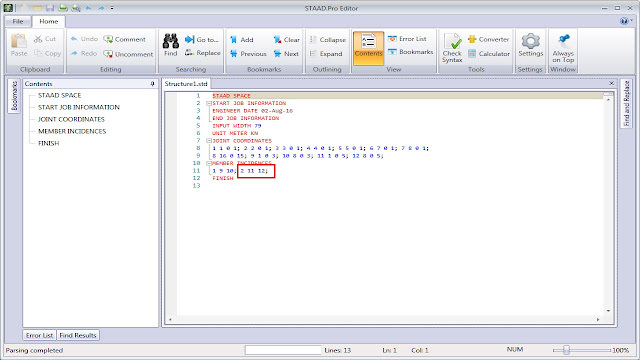 the syntax shall be " beam number followed by start node and end node". Add beam from point to point: As shown in picture, click on this add beam button followed by clicking on first and second node consecutively will add the beam between those nodes. Add beam between mid points: This option can be used to add beams between two existing beams. When you select this option followed by first beam and then second beam, a beam between these two beams are created at their midpoints. 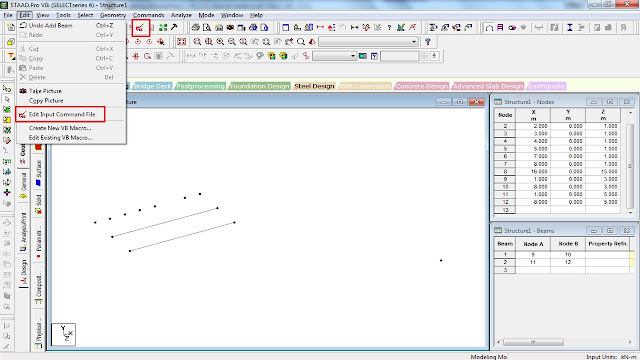 Add beam by perpendicular intersection: Select this option followed by one node and then a beam to which a perpendicular beam is to be prepared. a beam will be created from node to perpendicular to the beam being selected. Add curved beam: This option is selected for adding the curved beam. More on it shall be taught later. This is perhaps the best way to create beams. 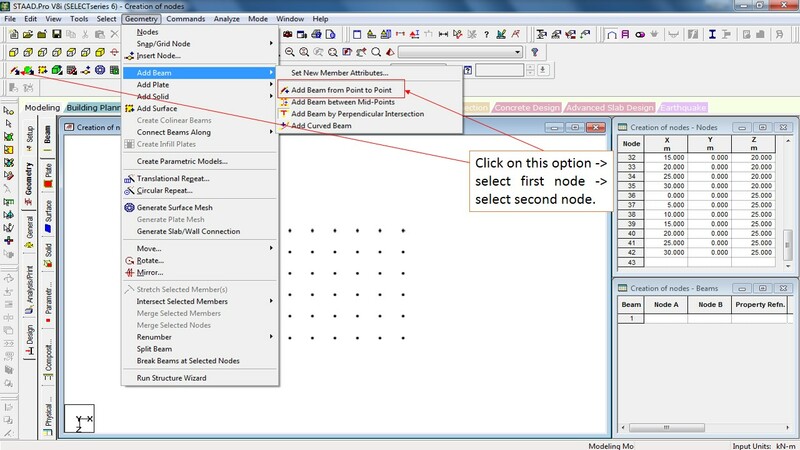 just select the nodes which you want to connect by beams, go to geometry, select connect beams along followed by the direction in which you want the nodes to be connected viz. x,y or z. and the beams are created. The other ways of creating beams are copy pasting it as per your creativity(the direction and way you want) and translation repeat. Found helpful? share with your friend and subscribe to email updates and Tip Me a Tea!